Hey... heavy minimalist post warning. I know it's a Bank Holiday Monday here in the UK and we're all feeling chilled and grateful for some half decent weather for a change but I haven't written about minimalism in general recently. So, I thought this week I would provide a few questions and answers about my minimalist journey. I have included some questions for you just in case you want to join in with me. Purely optional... I don't want to nag or preach. I was first attracted to minimalism because I felt overwhelmed and stressed. I had too much stuff and not enough time, I was dissatisfied with our consumerist society and I found it hard to relax. Both the ethos of living a less materialistic lifestyle and the aesthetics of living in a calmer and more organised space appealed to me. What I craved most was the chance to have regular time to be able to stop and stare. How about you? Do you think you could be happier with less stuff and less commitments? What attracts you to minimalism or a simpler way of living? Which minimalist blogs are helpful? Reading minimalist blogs gave me the inspiration to not just start on a journey of decluttering but also to evaluate my work life balance and learn how to relax and be content on an everyday level. The following blogs have advice for all these aspects of simple living in their archives. They are the big names in the world of minimalist blogging. 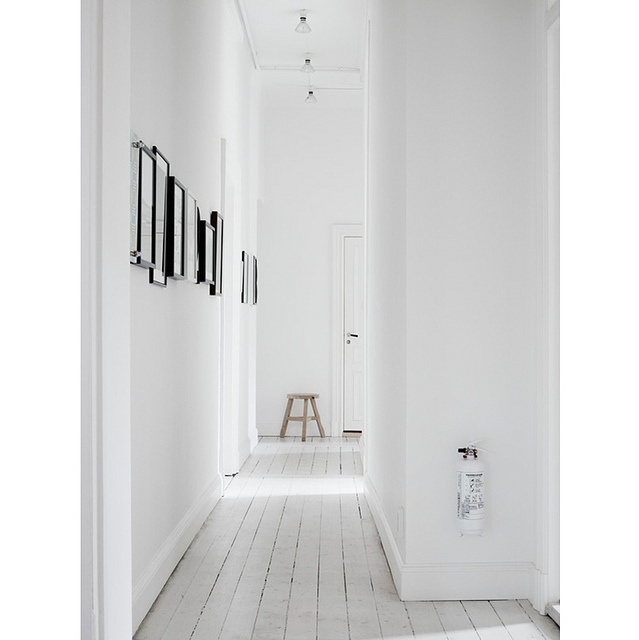 However, there are lots more lesser known minimalist and simple living blogs out there. Check out my blog roll for some that I regularly read. How about you? Are there any minimalist blogs you'd recommend? Does reading about minimalism keep you focused on simplifying your life? Will decluttering and simplifying my life make me happier? I thought that reducing my possessions, my materialistic aspirations and my financial commitments might be the answer I was looking for. It was. More than two years on I am now am on my way to having the life I wished for all those months ago. I have reduced my possessions considerably, I live in a smaller home with a smaller mortgage, I work part-time and I have more time for my family, friends and interests. My life is still hectic at times but in a much more varied and fulfilling way. And I do get time to stop and stare, regularly. Every time I declutter I feel better for it. I don't want to sound smug and maybe you don't need to downsize or change your career but I guarantee any amount of decluttering will make you feel better once the ordeal is over. How about you? What is stopping you from decluttering that space or room? How do you feel after a good clear-out? Could you make more time for things you enjoy? How can I stop feeling trapped? In the past I felt trapped and could not see a solution to my stressed life. But then I realised that I had trapped myself by choosing to take on more responsibility at work, more financial commitments with each house move and spending more money generally than I needed to. I had been too busy to notice how much this life was costing me in ways other than money. My health, my relationships and my enjoyment of life were all beginning to suffer. Realising that we had got ourselves caught up in this trap was the easy step. Step two was a lot tougher - working out how to free ourselves from the life we had created and the finances needed to pay for it. Our decision to downsize to a smaller house was made for financial and personal reasons. Moving to a smaller house felt at first like a backward step and it took a long time for us to reach this decision. Downsizing our possessions and finding a suitable family home on a smaller budget was hard work but now one year later we can see that it was definitely the right thing for us and it has had a positive affect on our lives. We have more control over our finances, we have more flexible time, we live with less stuff and we have have stopped chasing materialistic goals. How about you? Could you live in a smaller home? Is it possible to reduce your outgoings? Could you work less hours or change your job? Is fear of change holding you back? I hope these questions and answers have been useful whether you are a new or long-term reader here. Minimalism can sound extreme and off putting and also contrived and posey. I don't view minimalism like that at all. I see it as something that can set you free and can be a useful tool in reducing the stress, greed and waste in our lives. I started writing Just a little less because I was inspired to document my downsizing journey and quest for a simpler life. At the time there was a distinct lack of presence of UK minimalist bloggers and I wanted to add my voice and view to this worldwide community. I enjoy writing about minimalism and still regularly comment on many minimalist blogs. What I also enjoy writing about are the simple pleasures and the joys of everyday life. Learning to create and find these moments is something that everyone can benefit from. Minimalism helped me on my journey to a simpler and happier life. If I had not read those minimalist blogs and started on my decluttering journey I don't know if I'd be where I am today. I must state that my minimalist journey is not over. I see it as a long term project that I can adapt and adopt to suit and enhance my life. How about you? Has decluttering, downsizing or changing your career/life plan enhanced your life for the better? I'd love to hear from you. Thank you for your blog! I visit it often. Six years ago I completely purged our home of "stuff." It felt like I hit the reset button - it was wonderful. I also stopped the over-consumerism treadmill that I had been on and haven't looked back. Our finances reflect the transformation (no debt and close to paying off the mortgage this or next year at age 47). I can't imagine ever taking out a loan for a car anymore, nor buying a brand new one. Minimalism has brought so much freedom to our family. Well, as you know, you're preaching to the converted in my case - but I have to say I really enjoy reading how you (and others!) actually go about the minimalising and decluttering. Your smaller home looks inviting and tastefully decorated and is bound to be appealing to anyone considering this step. Moreover, you have teenagers and I believe strongly that we need to pass the message on to the next generation! I wonder if your sons would feel like commenting on how they perceive this change in all your lives as they begin to think of the next stage of their own?! Reducing, decluttering, simplifying have all given me a lot more freedom in life and long-term, our whole family. As we once more begin a serious round of selection and collection (under the stairs for want of other space! ), it feels good to know we can release "stuff" more easily. Right now we need to bring a flat's worth of belongings and some furniture back into our home in the next few months and the only way to do that without suffocating is to purge. With elderly parents and grandparents, we also know that there will be similar clearing projects in the relative near future and when the time comes, we will be glad to have honed these skills. It doesn't mean we throw everything out, but it does affect how we consider objects - are they just nice or pretty or useful or do they really have meaning for us? Thanks for the work you put into the blog to make it so interesting! This post was really pertinent to me last night after working a 13 hour day on a lovely bank holiday! I'm off tomorrow and I feel a purge coming on!! I have read a number of minimalist and blogs over the years, I can't remember what sparked off my interest in the first place. My mother in law was very good at decluttering, whereas my parents had so much stuff. I think the Miss Minimalist book took me firmly down the decluttering road. It is a wonderful feeling getting rid of things and I love the simpler life and extra time it has given me. I find reading other blogs that share some of these aspirations keeps me going. We would like to move to a smaller home in the next few years by which time we will only having things around us that we use and love. I don't go out to work these days, even though I'm a young'un. I think living a more simple life has helped to make that happen and has also helped to make our life more simple too. It means when DH can take a day off we can just head off and do what we like, no having to jiggle days off. We don't have the stress of both being worn out after work each day (I went from working 14 hour days to being at home so it was a huge change). The house is dealt with so our evenings are our own to do what we like. And as we're not spending that time shopping or trying to squeeze too much in it's very calm and relaxing. We spent so much time in our early relationship running around, taking ourselves too seriously and being desperate to not miss out we couldn't see what we really felt was important. I live in a much smaller house than previously, and am also a recent "empty nester," so it has been quite a journey from Family Living to Couple Living. My life style has changed a lot, and I find my wants and needs have been downscaled. Somewhere inside I think I was always comparing what I could provide for my kid, to what other families had or did - even though I was not always conscious of it.